Seeing the Miami Heat players palling around with Michelle Obama in the "Let&apos;s Move" White House clip that made the viral rounds last week brought some warm, fuzzy memories to 90s kids everywhere. It brought me back to a simpler, sillier time — the &apos;90s — when athletes were crossing between acting and music left and right, totally lampooning themselves across all our various media outlets for our entertainment. It was glorious. Shaquille O&apos;Neal, Charles Barkley and Dennis Rodman — the &apos;90s athletes that made it big in the media — were clowns. Now, though, we&apos;d rather obsess over a Richard Sherman freakout than see some self-conscious amateur acting. It&apos;s shocking to see how times have changed. The movie that made us believe we could fly. The movie that helped us channel the rage that we felt watching Michael Jordan try to play baseball, into laughter. The movie made us believe we too could train a team of anthropomorphic farm animals to take down the American corporate structure (Space Jam was the &apos;90s Animal Farm). So many inspiring lessons, so much terrible acting. 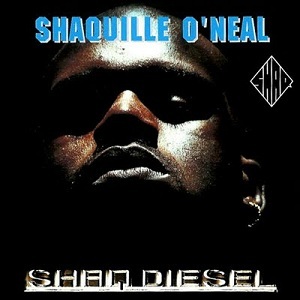 Fun fact: Jay-Z ghostwrote Bugs Bunny&apos;s rap verse that appears on the soundtrack, which explains the flow: "Like Trump&apos;s wife, up to my ears in carats (carrots) / Not even the brotha can fade the rabbit"
Michael Jordan&apos;s Space Jam may be the most memorable athlete crossover movie, but Shaquille O&apos;Neal is the god of the cultural crossover. The man was a quintuple threat throughout the &apos;90s into the 2000s: NBA superstar, actor, rapper [see below], video game superhero, and soft drink entrepreneur. Kazaam has extraordinarily low replay value, but damn it was a good time back in the day. "That&apos;s me. Who can it be? / The master of disaster, 7 foot 3"
"People walk around like they got charred / But I&apos;m big like a gorilla, 6-7, large"
"You better than Shaq-attack, fool? Shut up liar / I lean on the Statue of Liberty when I get tired"
Apparently Shaq&apos;s height fluctuates based on his mood and perceived threat level, not unlike a puffer fish. Rodman plays an exotic arms dealer named Yaz who surrounds himself with transvestite henchmen. He teams up with Jean Claude Van Damme, a stay-at-home secret agent dad, to gunfight through maternity wards, amusement parks, and Roman colosseums filled with tigers and landmines. Does anyone want to drink a whole bunch of Surge and/or Mellow-Yellow and watch this with me tonight? Nike executives were trying to find a way to explain basketball in terms that Japanese consumers could understand, and so they came up with this: the "Battle of the Century." The concept was so popular that Nike decided to run the commercial around the world. And then it turned into a comic printed by DC/Dark horse. This is the battle Hollywood needs to be rebooting. Godzilla would be nothing without Charles Barkley. 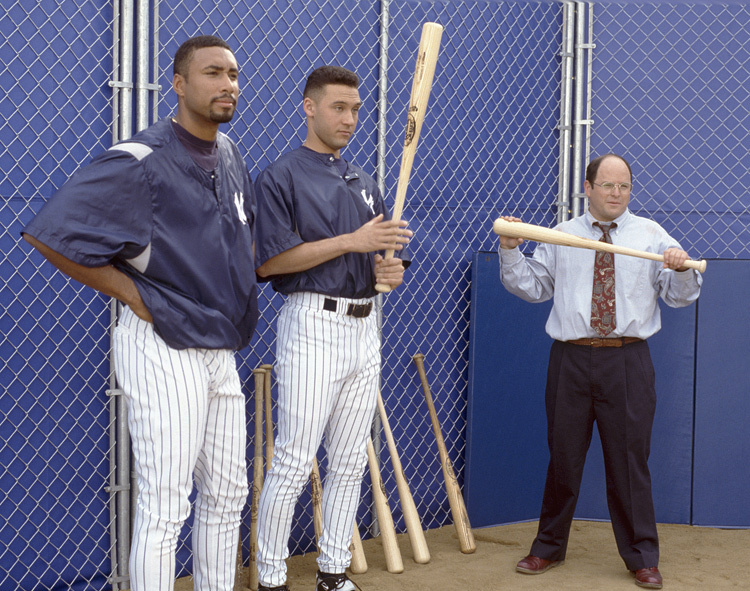 Seinfeld&apos;s plot was perfectly structured for baseball cameos sine George Costanza worked for the Yankees in seasons six through eight. It was so easy for the characters just to stumble into locker rooms to interact with Derek Jeter, Bernie Williams, Paul O&apos;Neill and Keith Hernandez (a Met). Their performances all had that classic athlete&apos;s stiffness. Mix that with some loosy-goosy Seinfeld prattle and you&apos;ve got comedy gold. Granted, this happened in the &apos;80s, but it&apos;s also too good to pass up. Kareem Abdul-Jabbar is the most intimidating variety of triple threat. He&apos;s a professional basketball player, an actor, and a black belt martial artist. The man trained under Bruce Lee and appeared in Lee&apos;s last film as the final boss, using Lee&apos;s very own fluid and brutal Jeet Kune Do against him, with a ton more size and strength to back it. He also appears in Airplane! playing himself, weekending as an airline pilot. There&apos;s some classic athlete-as-actor rigor mortis in this performance, too.